I updated my Weight Loss Page and hope that the success I have had on this continuing journey can help someone else. For myself, it is time to make a change. I tried this change once before, last year but I failed to follow through. Here it goes. . . In this journey of keeping the pounds off I weigh myself daily. First thin each morning for six years I have gotten on the Scale-God once a day, skipping it on mornings when I had less than 5 hours sleep, or when I ate dinner too late the evening before. Weighing daily has helped me when I needed to acknowledge that my quantities needed adjusting. It helped motivate me as the pounds came off. It gave me a happy-shot in the arm before breakfast. Those are the positives. 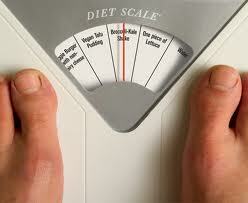 Now for the negatives: Scales do not measure fat loss. Scales measure physical weight. Weight loss due to loss of water and muscle? The scale won't tell. Weight gain due to sodium, medications, stress hormones, or too many calories? The number on the scale does not differentiate. For someone tracking every ounce this can be maddening. The squirrels in my brain start playing games. What if I eat less at dinner? What if I skip all sodium after lunch? Did I have a bowel movement yesterday? Carbs in the evening? What if that makes the scale go up? Should I weigh or wait? It becomes compulsive thinking behavior. 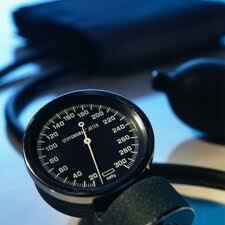 Last May I stopped taking blood pressure medication because my doctor said I did not to need it anymore. Once off the medication I immediately dropped ten unexplained pounds. Obviously the medication was keeping that 10 pounds on me. Now I need to re-visit taking the blood pressure medication and I am concerned that the scale is going to reflect a gain due to the medication. The squirrels in my brain are awake. If I need to take medication then I must take medication - period. I cannot allow my vanity and insanity over the number on the scale to stop me from properly protecting my health. For the next month I need to scale back my sodium and take my blood pressure every day. If the BP does not go up I can forgo the medication. I have decided at this same time I need to wean myself off the daily weigh-ins. I am going to try to change my behavior and switch to weighing once a month. I know this is not going to be easy because I like the high of seeing a weight loss and I like the security of seeing the weight not increase. In scaling back weighing my body am I going to get sloppy and think I can eat what I want because I am not getting on the scale for X number of days? I think I am grounded and balanced enough today that I can eat within my food guidelines and not need daily accountability to the Scale God. I weigh and measure my food. I work out 5 times a week. I know how my clothes fit. There is no reason for a weight gain right now as long as I maintain what I am doing and remain honest to myself. I will be weighing in on the 1st of May and the 1st of June. We do not revisit taking blood pressure medication until my appointment in June. Should not be any gain during that time it will not be due to medication. . . .
On this quest of keeping the pounds off, has the scale become a God? Are you using it for a friendly pat on the back on losing days and as a stern chastising parent on gaining days? Are you giving it the power to determine what kind of a day you are going to have? I think all of us maintainers have to ask this question sometime in our journey. I have, and I gave up the scale for 3 months because it was wreaking havoc on my mental stability. I felt fat, I looked fat in my head, but when I caught myself in a photo or mirror I'd think "I am not fat". I went back to weighing a few weeks back when I noticed my clothes were getting tight. I had to make a change in what I was doing and the scale showed me just what my clothes did I was gaining. So adjustments were made and things are getting better. The scale doesn't have the affect on me like it once did. I've accepted that I am thin and the number on the scale is good for me. I weigh every Saturday morning, sometimes I skip if I feel like it. Just take it a day at a time. Thank you for sharing this with me Sheri. I really appreciate hearing the experience of others. I know Gary's work. Thank you for your thoughts however I am already as low carb as you can get and still get all the proper nutrients without taking supplements. I do not have flour, sugar, pasta white potatoes, white rice (except on sushi days) or wheat. I do not juice my fruit servings. Day three without the scale and with less salt in my cooking. It is all one day at a time. I have to admit that I'm a scale junkie. I do seem to do better, however, with a daily weigh-in. It was interesting to me that you lost weight when you ditched your bp medication. I gained weight overnight when I went on a beta blocker. It has made losing weight more difficult, as well. BTW: Thanks for stopping by my blog and encouraging me with the 5-K training. I'm motivated! 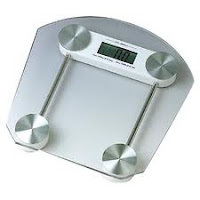 I used the scale daily for a long time and for a long time I know it worked for me. It is only recently that i can see for myself that I was now, at this point, using it in a way that may have held me back. I needed it for motivation before. Once the daily and weekly drops were done I should have switched to once a month. We will see how it goes. That's amazing that you immediately lost 10 pounds. Pills and weight are something that are rarely discussed. Doctors rarely say "This might cause weight gain." I ALWAYS ask now. I experienced weight gain on a medication and as soon as I stopped it,I lost weight! 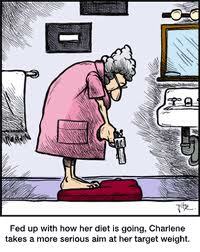 Even after all these years - I'm a daily weigh-er. For better or worse, it works for me. In times when I've "experimented" with non-daily weigh-ins, I gained weight. I'm strange, I guess!! I do not think that is strange. Heck, that was me at one point. The only difference now is that my food plan is not open for debate anymore, so the weight should not go up. I am glad I am doing this before starting the BP meds. I do not want to use the meds as an excuse to gain. On the other hand, I do not want to NOT take the meds if I do wind up needing them.